HANDS-ON-BOOKS: Nonfiction for Kids with Fun Activities: Catch Some Red Planet Fever: Mars in 3-D! Catch Some Red Planet Fever: Mars in 3-D! Mars rover Curiosity looks towards its destination—Mount Sharp. Do NOT adjust your monitor! You just need some 3-D specs to clear up the above image. Then you can see this amazing view of a cold desert planet 140 million miles away—Mars. The intrepid photographer is superstar Curiosity, the latest Mars rover to explore our Red Planet neighbor. Don't have any of those old blue and red 3-D glasses? Making your own is fun and easy. I'm posting an activity below that has instructions for making you own pair of traditional 3-D glasses. It’s from my book Exploring the Solar System: A History with 21 Activities. You'll want a pair in the upcoming months as Curiosity sends home more 3-D pics to NASA. I’ve written quite a lot about Mars over the years for kids and teachers—articles, chapters, web content, books. 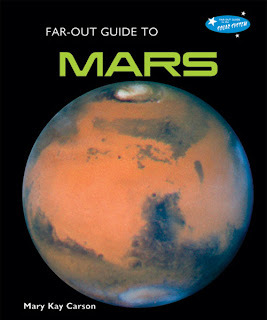 The most recent published is part of a 12-book solar system series titled Far-Out Guide to Mars. For teachers out there, note that there are Educator's Guides for each book in the 12 Far-Out Guide to the Solar System series, too, including one for Far-Out Guide to Mars. Writing about Mars never gets old because there are always new research findings to learn about, future missions to check in on, and mounds of spectacular images to peruse. I did the photo research for Far-Out Guide to Mars and whittling down the choices was painful! There are currently, right now, at this very moment three spacecraft orbiting Mars and three rovers on the ground. Orbiters have mapped Mars in exquisite detail. We have better maps of Mars than Earth’s ocean floor! The Mars Exploration Rovers (MER) bounced down onto Mars in January of 2004 and were supposed to rove about for 90 days. Spirit gave up the ghost in May after more than eight years of service, but its twin rover Opportunity is still going and going…and is now checking out clay minerals on the rim of Endeavour Crater. Curiosity is a different beast than the MER rovers. And by beast, I mean big and beefed-up with instruments. It’s real name is Mars Science Laboratory (MSL) for a reason. Curiosity is twice as big and four times as heavy as the MER rovers Spirit and Opportunity. MSL is packed with ten science instruments, cameras, a robotic arm, and a rock-studying laser.It also has its own power source so isn't dependent on solar power. This means it can work year round. Can't wait to learn what it discovers! Go, Curiosity, go!